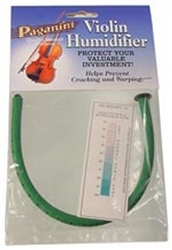 The violin viola & cello humidifier works great for all instruments! Simply soak in a sink full of water, pat dry and place inside the f-hole. This humidifier works great in the very dry and hot weather and centally heated houses in winter. This will assure that your instrument is kept at the right humidity and safe from damage. Check it regularly for moisture.